Every customer-facing corporation has at least one call center. In the United States, call centers handle a billion calls per year. Call Center Operation gives you complete coverage of the critical issues involved in the design, implementation, organization, and management of a customer call center. Sharp provides information on advanced technology tools for workforce management, workshop examples for training call center staff, and an analysis of the significance of the call center to overall corporate customer relationship strategies. 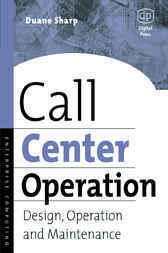 A special feature of the book is its focus on call center case studies, describing a number of successful call center strategies and best practices, selected from various business sectors - financial, retail, healthcare, travel, technology, and others. These case studies provide useful guidelines based on successful corporate call centers that will guide you in establishing and maintaining the most effective call center operation for your enterprise.